In director Geng Jun’s Free and Easy, a traveling soap salesman Yong Ge (Zhang Zhiyong) arrives in a semi-deserted, decaying Chinese town. When he encounters a young man who peddles training in martial arts skills, Ge gives him a bar of his soap to smell. Then martial arts trainer immediately passes out and the salesman relieves him of his watch and wallet, and then lights his usual two-at-a-time cigarettes. The young man revives and meets a Buddhist monk (Xu Gang) who tries to sell him a talisman but, in turn, gets his talisman stash taken away. The young man reports his robbery to the police who largely ignore him and discuss ways in which one of them can obtain some good drugs for himself. Salesman Ge rents a threadbare room in a rundown boarding and meets another tenant who is an arborist and whose comely wife (Wang Xuxu) runs the establishment. Later, Ge pulls the soap-a-dope on three more unsuspecting men and later on the same monk. A Christian Evangelist revives the monk and gives him food after which the ”monk” confesses that he is not really a holy man but simply a “con man.” Ge tries to lift a gold bracelet from an old woman who turns out to be a fellow crook. She summons her two male accomplices who give the salesman a taste of his own medicine and administer a beating to him and the monk. The “monk” and Ge form an odd-couple partnership and start knocking people out with the soap and then robbing them. When the pair gets the drop on the local cop, (Weihua Wang) the latter recognizes the soap salesman as a childhood school buddy. The three men return to the apartment complex where they go on an epic bender that ends in a tragedy, forcing Ge and the monk to perform a quite literal cover up. 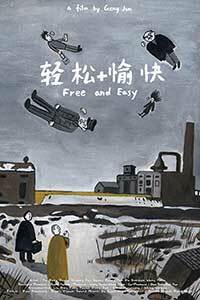 Free and Easy is really a slow burner with some very long pauses punctuating some very sparse dialogue. The camera crew are the real stars of this show and deliver a stark post-apocalyptic backdrop of a desolate countryside and decrepit buildings along with a striking absence of vehicles or, for that matter, other people. Shot with Arri Alexa cameras in a 2K digital intermediate, the images are crisp and the contrasts extremely good. Writer/director Geng Jun is a veteran of the Chinese film industry and Free and Easy (the title refers to a regional expression where the film was shot) received a Special Jury award at the 2017 Sundance Film Festival. Cineastes will detect echoes of some of the 1960s French Nouvelle Vague films in which images frequently trumped dialogue and symbolism was rampant. Geng’s characters are loners who do not readily let other people into their lives and we have not gotten to know them or their dramatic motivation better by the film’s incongruous fantasy ending. Given a nearly blank canvas on which to construct his film, Geng turns this series of loosely connected vignettes into a commentary on a society where civility is in short supply, morals are rather loose or nonexistent, and crime is often the rule and not the exception. Free and Easy will expose its viewers to a different approach to cinematic storytelling that is worth a watch. Free and Easy will be available for sale and rental on Amazon Video, iTunes, and Vudu, as well as DVD and Blu-ray on August 15, 2017. Free and Easy is a thought-provoking film set in a desolate region of northern China that raises questions about the rule of law, morality, and the fabric of current society.